John and Chris continue their labour of love around the new Duffield Booking Hall with the unseen assistance of Geoff in what can only be described as Arctic conditions. The video is on the outskirts of Roma with standand and narrow gauge trains. The latter may be no more in the near future as metro developments takeover their role underground. A very busy day down at Derbyshire's favourite branch line. The 12.05 Wirksworth to Duffield service had loadings in the mid 70's which must be a record for the 'bubble car'. Unfortunately, due to problems with both engine throttles sticking our travelling fitters Jack and Jo were kept very busy during the trip to Duffield with frequent stops to try to rectify the problem. Thanks to the skills of the dynamic duo and hasty adjustments at Duffield, the train was able to limp back to Wirksworth only a few minutes late. The two car DMU set was quickly fuelled and made ready to undertake the rest of the day's service which was just as well as the passenger numbers increased for the 14:05 service. Our passengers visited us from near and afar today, the furthest being Ohio and Richard and John were kept bust conducting yard tours as well as looking after two parties of amateur photographers. Today's service was supported by the EVRA shop, model railway and Pullman Buffet. Down at Duffield the Station Foreman could be found gainfully employed grass cutting. In the yard at Wirksworth the LMSCA and 8F Group were busy working on their respective projects. Grateful thanks to the train crews and station staff today who ensured our passengers were well looked after and kept informed during the delayed 12:05 service. Sunny again today which enabled some good undercoating work to take place on the BSK. One of the SK's outside was receiving it's examination too. Work to investigate an issue with one of the engine's on 50253 has also drawn a blank today due to time running out. 55006 has had an FP exam ready to enter service once again after receiving reupholstered seats and a deep clean of the lino. 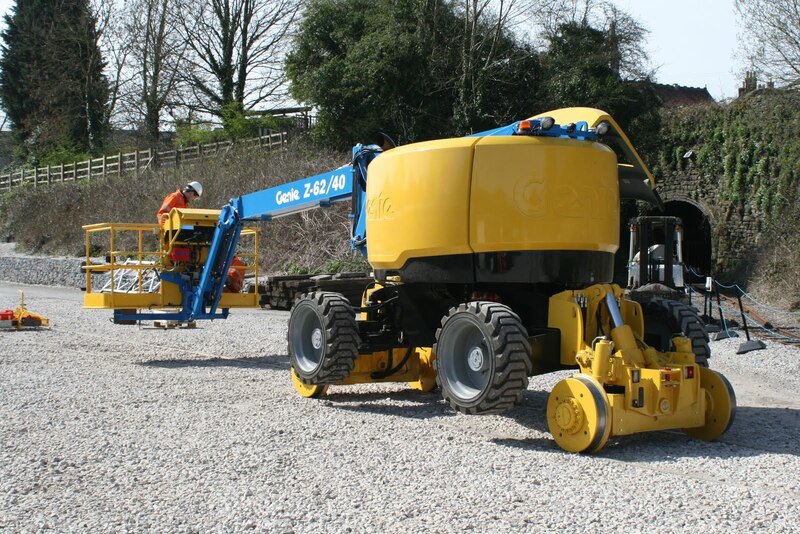 The PW were working near Hazelwood ballasting and we welcomed a machine on test, with somewhat varied results. 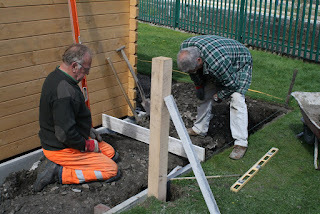 At Duffield, work continued on the pathways and other exterior items around the new Booking Office. We were pleased to welcome another test customer today and if only we had the money to purchase one! 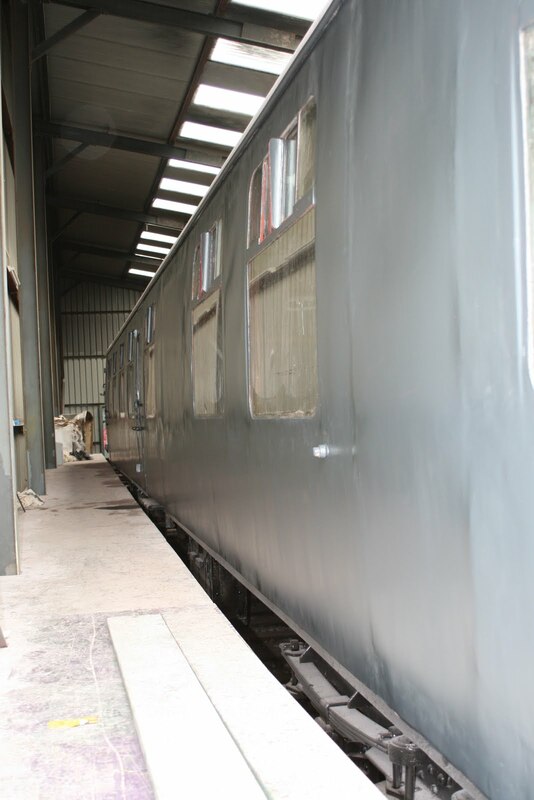 Also much progress being made on the coach painting front with the Second Open and Brake Second Corridor with Kitchen receiving attention in the Maintenance Facility. 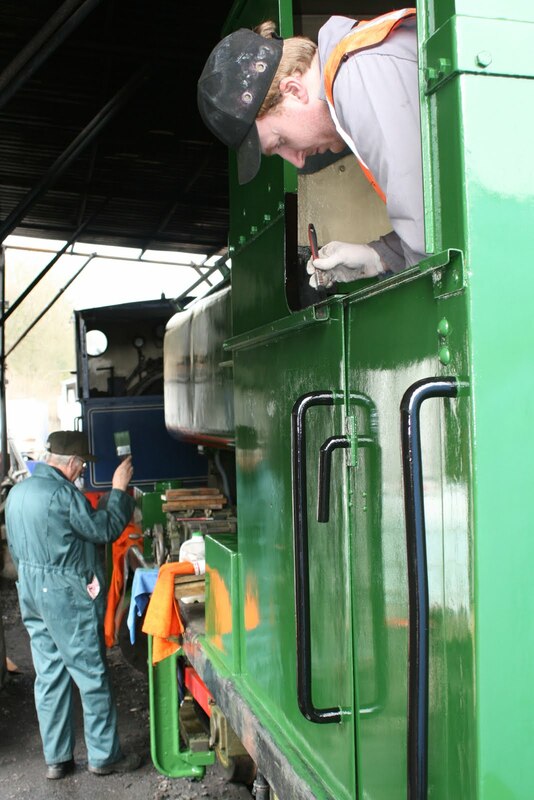 The famous Alan Taylor, reknown for painting and restoring our lineside furniture, can be seen cleaning the windows on the Second Open. The multicar received a good wash and engine levels check. We thought it needed a new clutch but it was stuck together whilst standing over the winter. Wow another Sunday busier than Saturday. Could it be the later start? That's three in a row now! It wasn't quite without it's dramas with the intended service train failing before the day began and the replacement being drafted in at short notice but all's well. The Buffet did particularly well again today servicing some pre-booked static Afternoon Teas as well as the bikers that come regularly. There were many comments from regulars about how smart the station area is looking now too which is pleasing. Down the yard, a shunt took place to reposition some coaching stock so the examination process could continue. Work continued on the BSK as the deadline looms ever closer. All in all a good day with the sun shining. It was fairly bleak in the Gem of the Peak today as winter returned for what is hopefully one last laugh. Very little in the way of volunteer activity today either except for some progress on the BSK and on the repaint of No.3. We did host a training session for the RAIB who were using the MyTestTrack facilities which helped to liven the place up a little. Fingers crossed the weather can cheer up a bit as we head towards May as the month brings us three special event weekends including Rocks and Rails, Multiple Memories and finally the Teddy Bears Weekend with the extra special Pip and the Great Teddy Bear Rescue too. It is fair to say that the passenger numbers today were fairly slack, at least until a party of 26 walkers bought singles at Duffield. The weather wasn't as bad as predicted which enabled Joe and Nathan to finish the glossing of No.3. Apparently it needs a couple of coats of varnish now but if the weather holds out this might get done fairly readily. In the other shed, the BSK was readied for painting and the SO is now in undercoat. Work progressed on the miniature railway with ash being laid to create a pathway. The DMU team did an oil change on 51073's No.1 engine following an issue earlier this week with that engine and then reformed the sets afterwards. A sure sign that Spring is here as the amount of painting reaches a crescendo. Illustrated is the splendid work on No3 by Joe and Nathan together with John Allsop's ministrations to the EVRA SO. On the adjacent Maintenance Facility road was the catering BSK equally being prepared by Dan for a coat of Maroon. A part two of Peak Forest is attached for Class 66 enthusiasts. 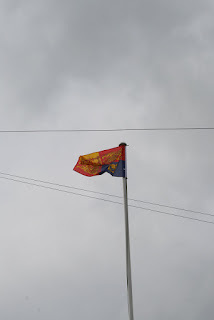 It was a delight to see the Permanent Way Team re-erect our flagpole at Wirksworth and test drive the Royal Standard which have in preparation for future events. 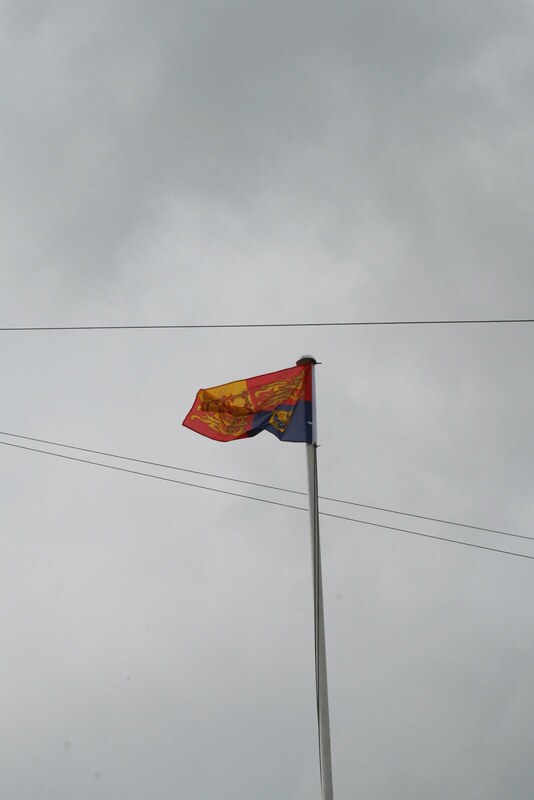 The history of this flagpole bears telling as its donor operated a flagpole manufacturing company at Ravenstor. During the cutting and burning phase in preparation for the Ravenstor line an enraged MD of the flagpole company descended on the Office saying that all the smoke from the fires was filling his factory. After being harangued for some time the said MD went away and, on reflection, felt he had overreacted offering to provide us with a splendid flagpole which we gratefully accepted. He subsequently sold his company and the building is now part of Harrington Generators. The accompanying video was taken en route to Rod's funeral, which had a goodly contingent of Railway folk, and shows more stone than we could cope with in an eternity! Gloriously sunny today which saw us equal the successes of last Sunday on our three train timetable. The Royal train ably handled the service for passengers to enjoy. The DMU Group finished the task of lubricating the centre pins on 50253 but a test run will be required to see if its fixed the problem. The BSK had the windows fitted and the electrical inverter was brought into life. Yesterday featured good loadings on the trains with the majority of passengers taking advantage of tickets we've been selling online recently. It was good to see that the forecast of hail showers didn't put people off too much! 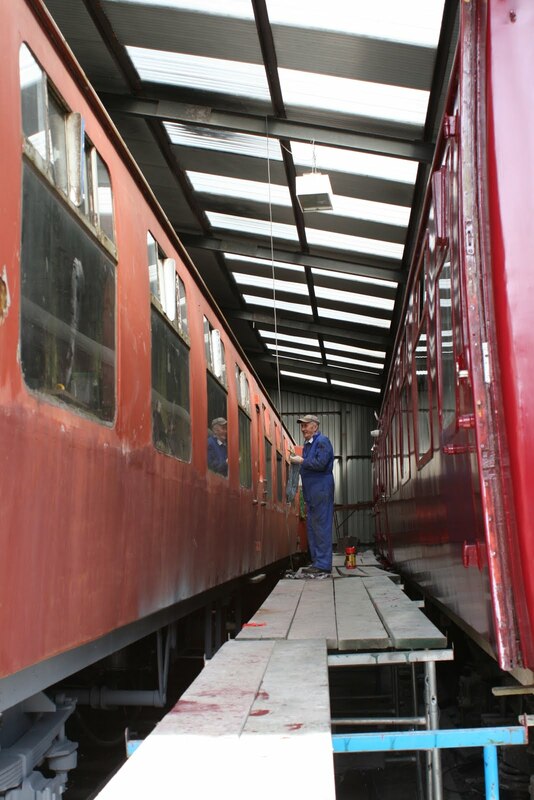 Down the yard, work has continued on the BSK on both days with all of the windows (apart from the sliding lights) being reinstalled into the vehicle. The DMU team had 50253 in a good position for ensuring that the bogey centre pin was getting a decent lubrication once again. 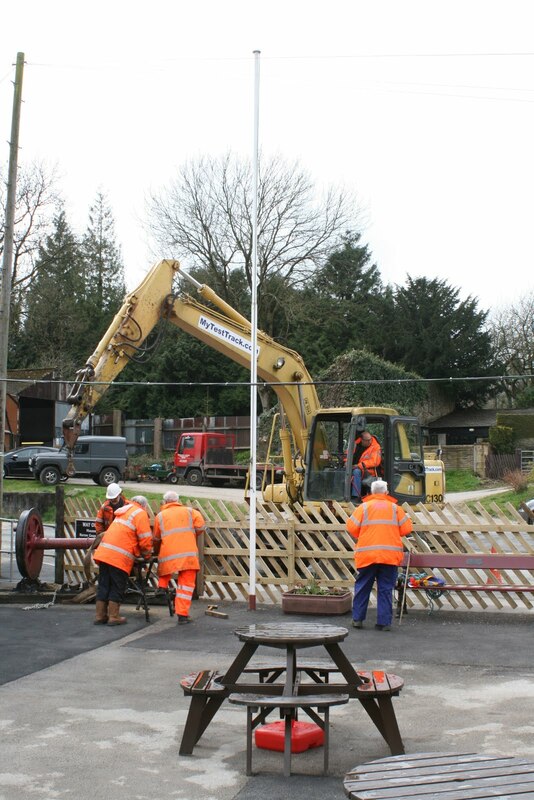 The PW team completed the current round of sleeper changing just south of Hazelwood as well as the fishplate greasing. They may now get a week or so's sabbatical before carrying on. Today they whizzed off in the Road/Rail Land Rover to Shottle to salvage some good sleepers out of the old Spondon material ready for further use. Painting continued on No.3 in the steam facility and some basic undercoating was done in some bare spots on the gents toilet. Today's photo shows progress on the new Miniature Railway at Wirksworth which will extend from the south end of Platform 1, under Wash Green Bridge and who knows maybe beyond. It is still very much a work in progress but there's certainly some potential there. now fitted. Well done the construction team !! Barclay No 3 is starting to shine with its top coat of new green. Geoff and John are pictured sealing the window apertures of the new Booking Hall pending delivery of the finished windows in a couple of weeks. The progress made in the last three days is quite staggering and a tremendous credit to the team involved. The second photo shows the Bishop's stumps! 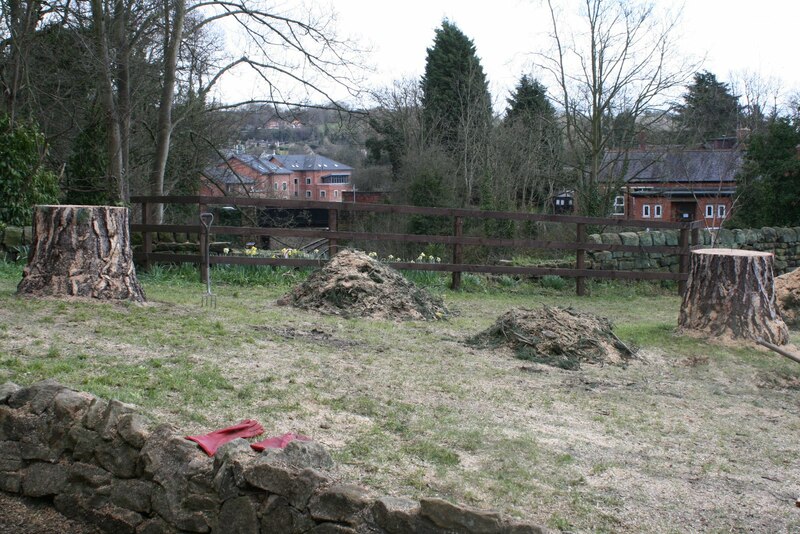 The three very large trees above Duffield Tunnel have been taken down and, speaking to the Bishop's gardener, a ring count showed they were of the order of 115 years old. The video shows Duffield in sunshine and whilst admiring the Bishop's stumps a sharp hailstorm pounded the 1412 Duffield to Wirksworth service - filming does have its risks. The end of what has been a most pleasant weekend on the trains. Yesterday was pretty busy despite the early morning monsoon, but today surpassed it somewhat. All three trains on the Blue Timetable had good loadings today but the credit goes to the buffet as their feet didn't touch the ground. A late booking yesterday for 16 Full English Breakfasts came as a little late surprise, but having risen slightly before serving today they pulled out all of the stops to ensure the customers had a great time. Very few others on site with the majority of the work centering on the PW Bubble. Another large patch of steel was welded in on the No.1 side and finishing work was undertaken on two patches done last week which couldn't be finished due to the weather being poor. The vehicle is outside at the moment so the best has to be made of any sunshine. Quite a good day and start to the month! Mary has advised that Rod's funeral service will take place at the Church of St. Thomas Becket, Chapel-en-le-Frith Monday 11th April at 1315hrs after a private cremation. All are welcome and there will be refreshments at a local hostelry afterwards. The church is in the centre of Chapel and the tower is visible as you approach the town. Mary also asked me to pass on her appreciation of all the kind messages she has received from those that knew and worked with him. Some indication of numbers that might appreciate a sandwich would be appreciated by Mary and I offered to advise so if you could let me know next Tuesday I will pass approximate numbers on to her. I suppose people would be expecting some sort of prank or other but there isn't one! Today we hosted another of our popular Drive a Diesel Day experiences with four happy participants firstly driving the two car Met-Camm unit followed by the Class 25 in the afternoon. They were also suitably fed by the buffet. 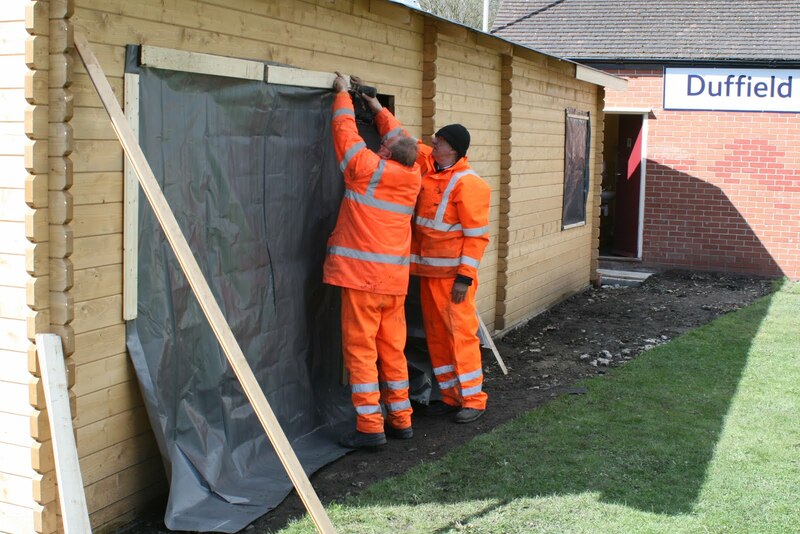 The station team were out in force tidying and beginning a small tarting up of the exterior of the Gents. A new door was hung a few weeks ago and this has now been glossed along with some of the rest of the exterior. A poster board was also put up so that visitors who happen to be sitting on our picnic tables haven't got far to go to look at the train times. An investigation into the condition of the foot gate at the bottom of the platform ramp on Platform 1 revealed that its basically beyond repair and will need replacing. 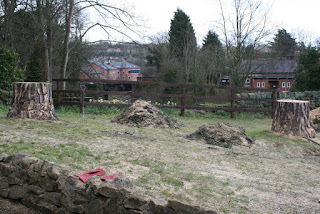 Work progressed on the miniature railway with much of the bank being cut back and dug away to provide a good 'loading gauge'. Some interesting artifacts were discovered including a small horse shoe and even a Golden Wonder crisp packet with the price of 5d written on it. A duo continued with the repaint of No.3 down at the steam facility and wiring/bodywork progress was made on the BSK in the shed. It isn't always a glamorous photograph... Today it's of the Gents!